Howdy! This week I take a look at one of my favorite fictional characters of all time. Not only is he super evil, but he’s also super funny. I watched Samurai Jack a lot when I was younger and there was a lot to enjoy in that show. The storytelling was top notch, the art style was brilliant, and the action was unmatched. Among my favorites was the show’s villain, Aku. His surprisingly comical stylings still crack me up to this day. So let’s take a look at that Master of Masters, the Deliverer of Darkness, the Shogun of Sorrow, Aku! Languages Abyssal, Celestial, Common, Draconic, Infernal; telepathy 100 ft.
Master Shapeshifter (Ex) Aku can use his shape change ability to take the form of any creature, regardless of size or creature type. When shapeshifting, he can also split his body to take on the form of multiple creatures at once. He can take the form of 1 Colossal creature, 2 Gargantuan creatures, 8 Huge creatures, 16 Large creatures, 64 Medium creatures, 256 Small creatures, and any number of Tiny or smaller creatures. When transformed in this way, Aku takes a cumulative –1 to AC attack rolls, damage rolls, saving throws, skill checks and reduces his form’s maximum hit points by 5 (to a minimum of 1 maximum hit point) for every creature beyond the first when he shapeshifts. Aku can revert to his original form as a free action. Identifying Reflection (Ex) Aku’s reflection always shows his natural form, regardless of which shape he takes. Powerful Blows (Ex) Aku applies twice his Strength modifier to his claw damage while in his natural form. 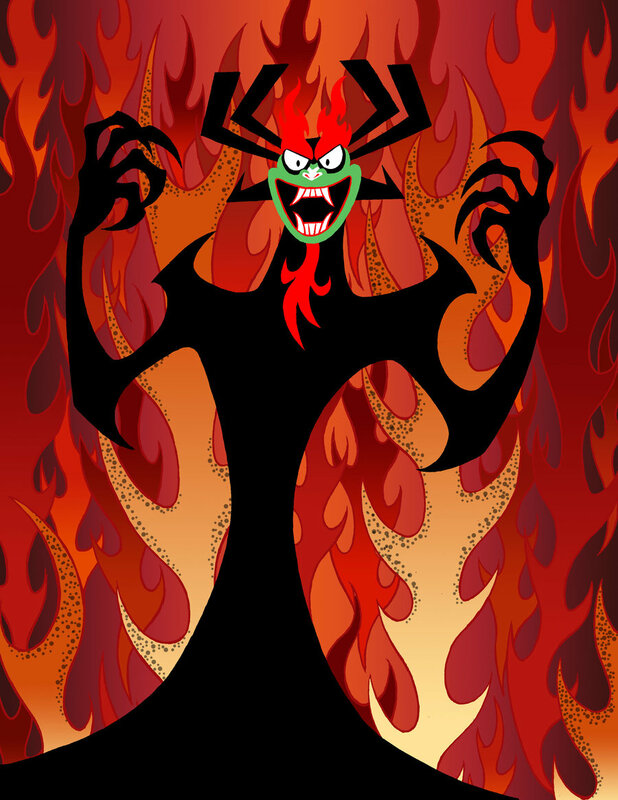 Aku is a demon created from the essence of pure evil, given shape in the world. This evil took the form of a massive humanoid imbued with magical abilities and great shape shifting powers. This form took the name of Aku. Aku is capable of great feats of wickedness and uses his magical power to spread his evil across the land. Some of his many powers include the ability to fire beams of destructive light from his eyes, teleport at a moment’s notice, take the shape of terrifying beasts, and even break apart into multiple, smaller versions of himself to overwhelm his enemies. His magical powers even allow him to fling his foes into the future, a time where Aku is uncontested and his evil is law. As a being of pure evil, the only thing that can truly destroy Aku is the power of good. This can be the divine magic or weapon of a god or pure righteousness in the form of the strength and virtue of the human spirit. Only those warriors with powerful spirit and great conviction stand a chance against the mighty Aku. That’s it for this week! If you end up introducing Aku into your game or you have any request for a future Monstrous Physique, please drop me a line at KnowDirection@hotmail.com. Luis Loza is a developer at Paizo, working on the Pathfinder World Guide line and formerly on Campaign Setting and Player Companion lines. He's done freelance for Paizo Inc, Legendary Games, Rogue Genius Games, and more third-party publishers. His hobbies include gaming both tabletop and video, making jokes, obsessing over time travel, taking naps with Nova the cat, and walks with heather the wife. He is eternally plagued with a hunger for tacos. Thinking he should have a larger suite of spells/spell-like abilities. He feels like a CR 30 character/creature to me … as I feel like Jack should be a mythic champion with 20 levels in Samurai/a Path of War class. Where are his ray attacks?! He should be able to use major creation far more than 1/day, yes?